Donna K here with you today sharing my totally CAS card. for one of my exercise buddies. I added a few flower sequins using Glastique to attach them. I think she's pretty fun and oh so cute. 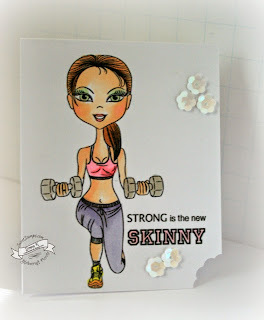 Don't forget about our latest challenge here at Sweet Stamps! You can find the link up on yesterday's post. This week's theme is Paper Piecing. Have a great day today!! Looking good- cool card design!